Liver also the only organ that can regenerate itself. Two thirds of the liver removed in surgery can grow back to its original size in as little as A WEEK! Isn’t it amazing? But we have overload our liver with many stuff: chemicals from household products, toiletries, drugs, hormone-injected food, alcohol, etc. When I saw the protocol, I was thrown back. WHAT? Can only eat vegetables and fruits? Not even fish! Those who know me, know that I don’t like to eat my greens *guilty-as-charged*. My hubby even commented, “Good luck!” when I told him I wanted to do liver cleanse with this protocol. And I can’t even stir fry vegetables. That’s the only thing that I can eat my vegetables. Or deep fried. Well, anything with oil… except salad with the dressing. So I have to live on steamed or boiled vegetables. Colorful vegetables, especially dark green leafy stuff is good. Oh did I tell you that I can’t drink or eat cold or chilled stuff. Great! Hot weather, no cold stuff. Just plain great. But I was determined. It’s time I take care of my liver. In the past 6 months, I had fallen sick twice! And each time I fell hard. Really hard. It has never happened in the last 3 years, except the recent 6 months. I was hardly sick, and if I was, I would recover in 2-3 days. These 2 times I fell sick, I could take 2 weeks to recover. So when I fell sick again last week, I decided to do liver cleanse. Just to let you know, there’s possibility of sluggishness if you do when you’re unwell. For me, I just wanted to do as soon as possible, before I chickened out. Below is the protocol. Let me tell you beforehand, you need to be real determined. Really determined. For me, the mucus came out from my nose for the first few days during cleansing. I was tired from blowing my nose. My nose became red and sensitive from constant rubbing. My rubbish bin was full of tissues. My girl got mild flu from me but she recovered faster than me. I had to sleep earlier than usual, around 1030 – 11 pm instead of my normal unhealthy timing which is 1-2 am. Well, that was the cause of my liver exhaustion. So I tried to pamper my liver and gallbladder by sleeping early. And the diet… oh, the diet… where I have to begin…. 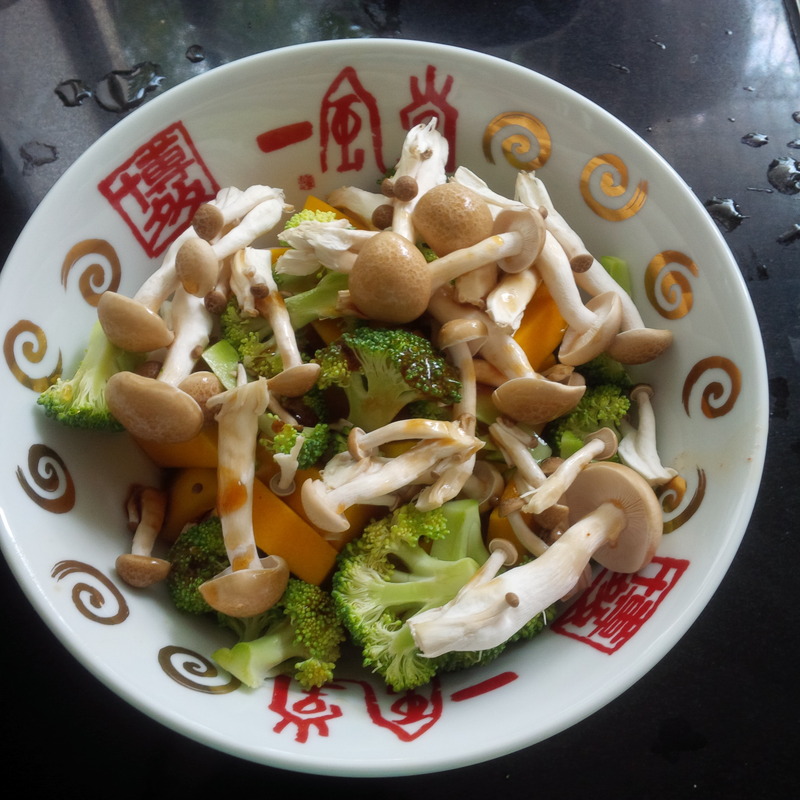 First day, I boiled the vegetables together. 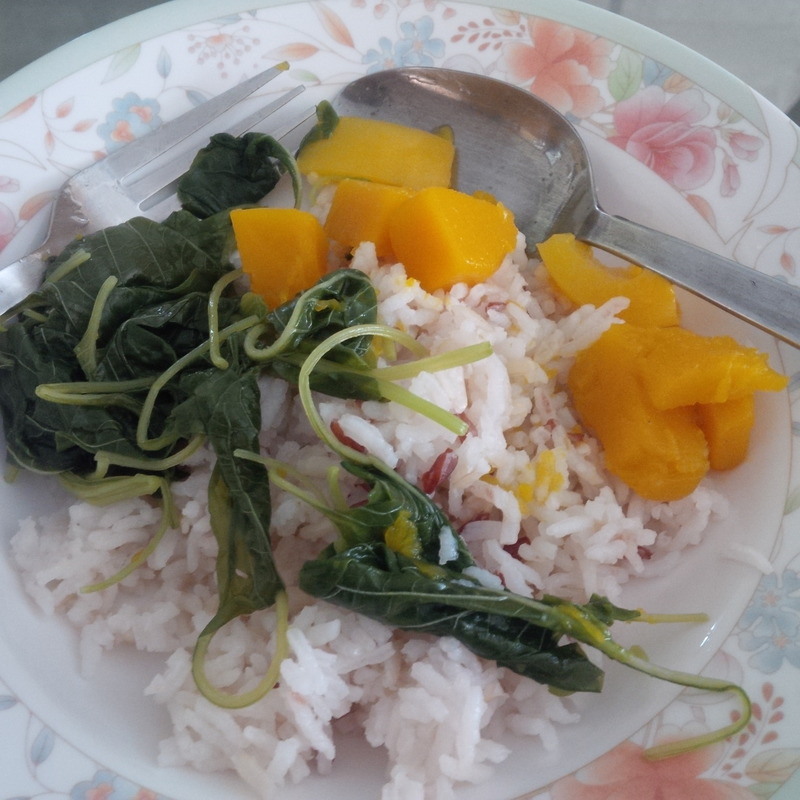 I ate with mixed rice and my sister upon seeing my meal, she said, “unappetizing!” and walked away. I told her, “then, don’t look.” with a joke. I passed my first day well and I was proud of my accomplishment eating those vegetables. Here’s my first day meal. On my second day, I already felt that I had no appetite eating the food. My husband’s meal look so appetizing. The smell was drawing me to it. I just had to pretend that I ate same food as his with this meal. And third, and fourth, and fifth day had passed. I had to say, I passed motion regularly in the morning and afternoon. sometimes, in the evening. My digestive system worked well with this diet. Before the cleansing, my bowel movement was every other day. That’s unhealthy. A healthy digestive system is you pass motion 3x a day. Anything that last 12 hours in your body will become toxic to you. The longer it is, the more toxic it becomes. So I was at my dreaded 6th day. How was I supposed to sleep at 10 pm. I had to put my girl to sleep before that and she normally sleeps 1030 pm. When I had to drink the whole bottle of apple juice in the morning, I felt nauseous. But yes, I managed to drink all of them. 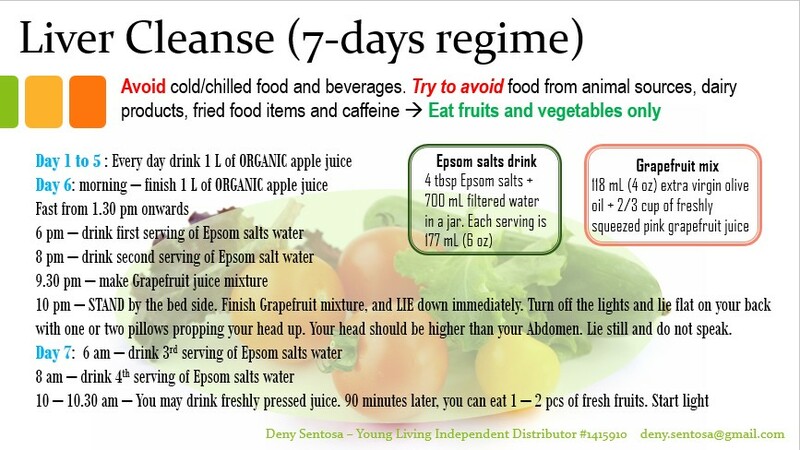 At 6 pm, when I drank that Epsom salt water, I almost vomited. It tasted terrible. Immediately after I drank plain water, the water tasted sweet! I gulped down my 8pm epsom salt water. My stomach rumbled. I just had to sleep early, I told myself. At 9.45pm, my girl slept. I was delighted she was cooperative. I went to drink grapefruit juice concoction and it did not taste as terrible as epsom salt. I slept. On the 7th day morning, after drinking my 6am epsom salt, I passed out stones. For the readers’ sake, I did not post the photo. But if you want, I can send you. I passed more stones as the day passed. I am glad that I have done the cleansing. My liver has worked hard in the past years and I just give 1 week to help it. There’s other protocol in Inner Transformation by LeAnn Dearduff, however, since JuvaTone is out of stock, I chose this protocol. Also, it’s important not to do heavy tasks because some slight dizziness may happen. Nausea also may happen, so please pay attention to your body. I was told I might experience nauseous feeling after drinking grapefruit concoction, so I standby Patchouli and Peppermint essential oils, both are great to help to reduce the onset of nausea feeling. I did not have that feeling though. Every individual is different, so please know your body. Also, I have few piles, and it bled a bit in my 6th day passing motion. But I decided to continue as I was almost at the end of my cleansing. I prepared Lavender in my toilet, just in case. It only happened once though. 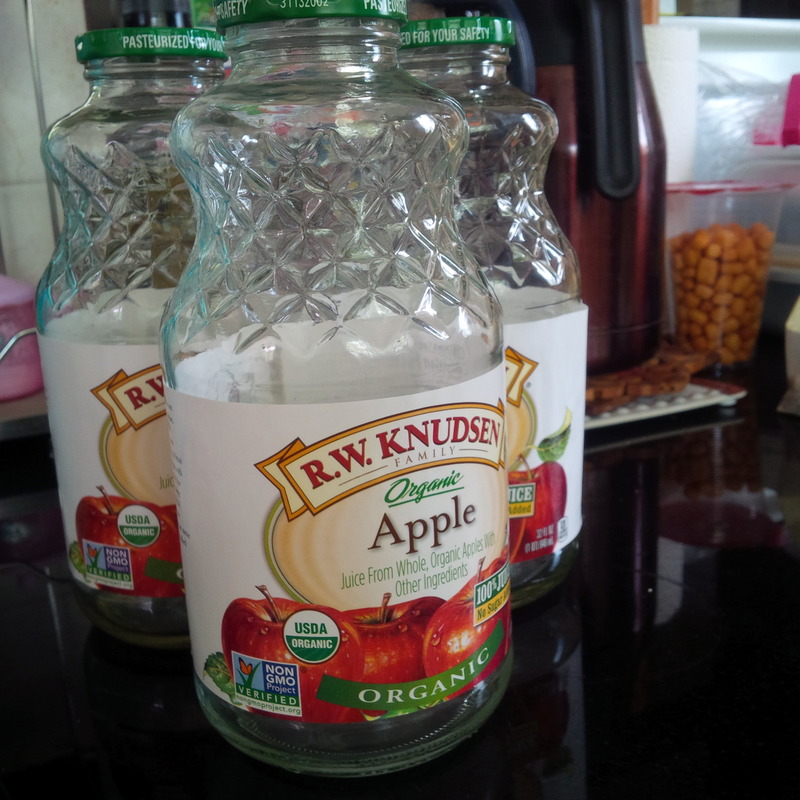 Also, for those wondering, I got these for organic apple juice. They’re empty bottles as I only remember to take pic after 6th day. I have total of 6 bottles. I got them in NTUC Fairprice in organic section, of course. After this, I need to support my liver. Here’s some suggestions by dear friend, Kai. P.s in case u r wondering, liver is part of digestive system!!! – Probiotics: Life 5. On empty stomach in the morning to work on the gut. The direction on the bottle says night after meal. My take is, the best time is when you remember. And normally I remember at night. – Emotional needs must be addressed through – stress is a big wicked thing for the liver. Oils like Release, Forgiveness, Harmony, Stress away would be so supportive! – Clean up your diet dude! Be kind to your liver because it will help you a lot in the long run!